Courtesy of Harry OlsonIn a side-by-side test of grafted tomatoes by Marion County master gardeners Harry Olson and Tobie Habeck, the fruits of grafted ‘Sweet Million’ ripened sooner than the non-grafted and had larger fruit. 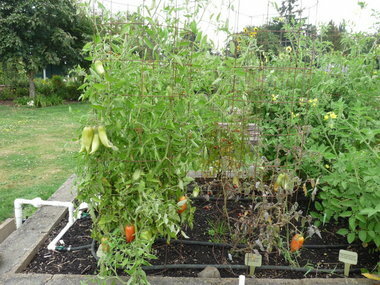 In this picture taken Sept. 17, 2011, the red grafted tomatoes were held up next to the green non-grafted. 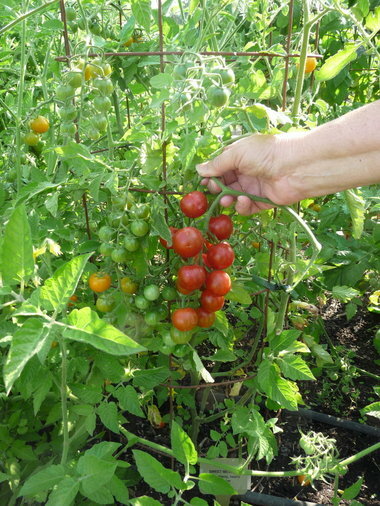 Grafted tomatoes, developed by Log House Plants by splicing good-tasting heirlooms and hybrids onto more vigorous rootstock, have been shown in trials to be bigger and better than regular tomatoes, with higher resistance to pests and disease, more fruit and a longer season. If you’re growing one or more this year, keep track of your results and let us know how it goes. Courtesy of Harry Olson Harry Olson and Tobie Habeck compared five varieties in their test of grafted tomatoes. All were the same size when planted June 14 and got the same care. 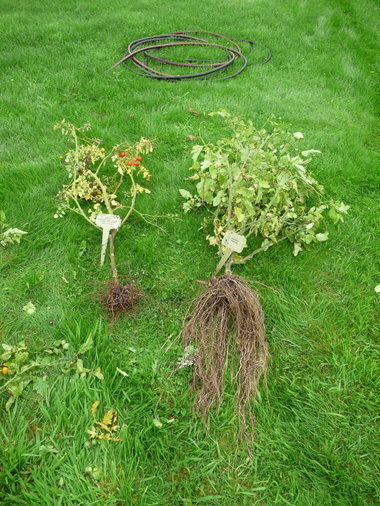 The photo shows a grafted ‘San Marzano Gigante 3’ (left) and a non-grafted (middle) in mid-September, after a watering mishap left the tomatoes without moisture for a couple of days. I had three grafted plants, which were the only plants that really produced anything. Next year I won’t plant anything but grafted. I did get some nice tomatoes, but not a lot, and they were not as large as I would have expected. Still, it was a bad year. I was very impressed with the performance of the grafted vs. the “regular” plants from Freddy’s. Grafted ‘Gold Medal’ was the best of my 57 varieties in 2011, and I praised its production in my “Tomato Newsletter” (published six times a year.) Grafted ‘Big Beef’ didn’t do as well, but location may have some effect. I grew two grafted tomatoes last year, ‘Brandywine’ and ‘San Marzano Gigante 3,’ both from Territorial Seed Co. I really did not like them. The plants grew huge, twice as big as my regular tomatoes, but set very little fruit. The tomatoes we did get were really big but they didn’t have a very good flavor, and with the rain, most of the fruit split. I did not order any this year and was not even tempted. Grafted tomatoes are definitely the way to go. I plant tomatoes either behind our garage or against the back of the house. They get from eight to 10 hours of sun and face south. Very warm back there. Never had a bad season! Last year, I planted two grafted tomatoes, ‘San Marzano Gigante’ and ‘Brandywine.’ Both plants were 6 inches tall when I received them from Territorial Seed Co. on May 28, 2011. The non-grafted tomatoes that I grew were early varieties, ‘Oregon Spring,’ ‘Siletz’ and ‘Legend,’ developed at Oregon State University. They were planted from 4-inch pots three weeks before the grafted plants arrived. Within a month, the grafted plants took off! I got about 15 to 18 fruits from the non-grafted tomato plants; 50 or more off each grafted. I had a super successful tomato season last year. And the year before, which was my first year gardening. Last summer, I planted 14 different varieties of tomatoes. After reading an article in The Oregonian last year, my husband suggested I try planting grafted tomatoes. I planted a single graft ‘Sun Sugar’ from GardenLife.com. It was the most delicious, prolific tomato plant ever! It grew to be at least 15 feet tall and produced hundreds of sweet, juicy tomatoes. This year I am again planting ‘Sun Sugar,’ as well as ‘Copia,’ ‘Ananas Noire,’ ‘Blush’ and ‘Pineapple,’ all single grafted. I am salivating thinking about the crop. I grew grafted ‘Brandywine’ and non-grafted ‘Brandywine’ tomatoes last year. I really did not see any difference. Both did very well, even with the short season we had last year. The tomato plants were about the same size when planted in very fertile soil. When the temperature warmed up, they grew very fast. But then the rain came and the temperature dropped. Everything collapsed. I don’t think it was a good test for the potential of the grafted tomatoes. Also, there were only two grafted plants, too small a sample to read too much into it. I’ve always liked ‘Brandywine’ tomatoes, but have been frustrated by their poor production. I’d get a few tomatoes, maybe a half-dozen. Last summer, I looked and looked for a grafted ‘Brandywine,’ but couldn’t find one, so bought a non-grafted one in mid-May. It performed as usual, progressing slowly, setting one or two fruits in its first month. Mid-June, I came across a grafted ‘Brandywine’ and decided to buy it, so I could compare. Keep in mind that the one had a whole month’s start on the grafted one. The grafted one grew phenomenally and got huge, but didn’t bloom for a really long time. Finally, in August maybe, it started to set fruit. And set fruit, and set fruit, all while continuing to grow larger and larger. But they weren’t ripening. Some time in late September, I decided that it was cooling off and rather than let the fruit rot, I should pick it, even if it wasn’t getting ripe. So, I picked all the tomatoes on both ‘Brandywine’ plants, but kept them separate. I had perhaps six or eight total from the non-grafted plant, as I expected. The first one or two had ripened already and had been picked and eaten. I had about four dozen (!) from the grafted plant. I kept all the picked green tomatoes on my front porch, which is enclosed, but not heated. All the ‘Brandywine’ tomatoes ripened (both grafted and non-grafted), slowly at first, then several at a time. We ate them all; they were all good. I didn’t notice any taste difference between the grafted and non-grafted. But the grafted ones looked better, less misshapen than the regular ‘Brandywine’ fruits tend to be. We had terrific success last summer with three grafted plants: ‘Brandywine’ and two cherry types. The largest ‘Brandywine’ fruit weighed 1 pound, 12 ounces, and many were more than a pound. My husband remembers we got at least 20 tomatoes off the ‘Brandywine.’ They were all meaty, sweet and delicious! One of the cherry tomatoes, I think it was a ‘Sweet 100,’ turned into tomatozilla. It was growing in a half wine cask, and had to be strung up into the tree branches overhead. It was covered with tomatoes right to the end of the season. This is the first real success we have had with tomatoes. In past years they were always puny and diseased. After a year of standing by, watching the action, fielding questions from clients and talking to people in the nursery business, I have to admit I was as curious as I was skeptical about grafted tomatoes. So, I set up my own less-than-clinical-but-credible experiment. I bought two tomato plants of the same variety, an heirloom tomato named ‘Brandywine,’ one grafted and the other non-grafted. I planted them side by side in an amended bed with the same exposure to sun and the same watering patterns and stood back and waited. When I finally did harvest a ripe tomato, it came from the non-grafted plant. The grafted plant had significantly more fruit, but the first tomato, the one we all wait for, came from the Plain Jane, non-grafted plant. The grafted plant was about (remember this is not a clinical study) 20 percent bigger and fuller than the non-grafted tomato. The sizes of fruit from the grafted tomato were all approximately 30 percent bigger than those from the regular ‘Brandywine’ with thinner skin. The color of the fruit was pinker and lighter, not the red/orange of the “regular” Brandywine. But, the most important outcome was taste. I taste-tested the fruit with a few brave gourmands. The tomatoes were picked simultaneously, hauled into the kitchen and eaten without accompaniment. The non-grafted ‘Brandywine’ tomato won hands down. The taste of the grafted ‘Brandywine’ was diluted and watery in comparison. It lacked that wee bit of acidity we all crave in a fresh, sun-warmed tomato and the texture, in contrast, was mushy. 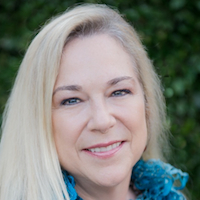 — Bonnie Bruce, garden designer, Celilo Gardens.